One of the oldest homes in Santa Fe, if only the walls could talk! 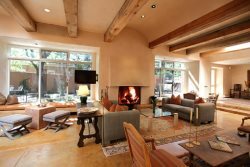 Enjoy ducted air conditioning while you stay in a quintessential Santa Fe home. Beautiful stained glass windows, unique fixtures, and other notes of fine crasftmanship adorn the home. Hidden just off E. Palace, the home is convenient to both Canyon Rd and the Plaza, and makes it easy to relax in tranquility. Queen bed in the master, the guest bedrooms has two twin beds that can be converted into a single king bed, sleeper sofa in the living room! The home is equipped with wifi internet and TV in the living room. Perfect. Wouldn't change a thing! It was awesome as always! We have been coming to SF for 30 years. We will never stay in a hotel again and would never consider using anyone other than Todd Davis for our vacation needs in SF. The ultimate in service and friendliness. Your company is great you seem to do everything right, customer comes first and you truly seem to care that things go well for the visitor. I am not a first time renter, Todd Davis has been especially helpful. All of the staff seems professional and well trained. Some body has instilled the proper work ethic and a way to handle people and situations. Our six weeks in Santa Fe were lots of fun. The staff of Casas de Santa Fe was friendly and helpful.